Hong Kong on Wednesday Night is Still Lively! All during my time abroad in Hong Kong there was always something happening. Whether it was birthdays, nights out or other random happenings, things never slowed down. Read my post to find out about the nightlife every night of the week in Hong Kong. The week prior was not a week for sleep, I can tell you that. Let’s see where to start this particular tale. I’ll start with Tuesday evening. It was my friend Kevin’s 22nd birthday on Tuesday, but he wasn’t too keen on going out for dinner with a big group of people (he said he wasn’t a big fan of being the center of attention), so instead he wanted to have people come to Unibar (the bar on campus), have a beer, and celebrate that way – low key. Well, to some of his closest friends at HKUST that was NOT acceptable, so a group of us conspired to get a cake, balloons, a card and surprise him with them at Unibar. The only snag was the people picking up the cake took longer than expected, so we chilled out as nonchalantly as possible at the bar for an extra hour before they finally showed up. While we were inside one person was outside phoning the party planners and trying to get an ETA from them without blowing the surprise. In the end though, Kevin was definitely surprised and I think it was just the sort of thing he was looking for after all. Everyone else certainly enjoyed it as well. Who doesn’t like free cake? 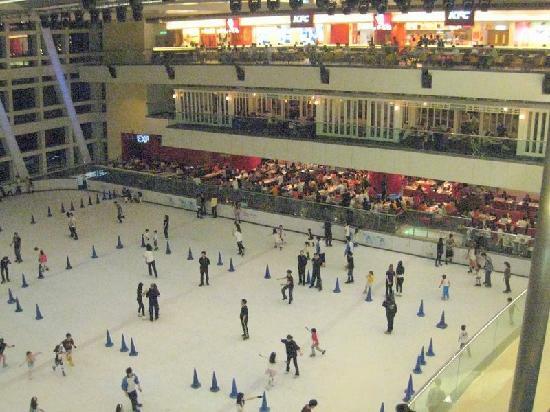 The indoor skating rink at Kowloon Tong. That thing’s huge. Now except for St. Patrick’s Day, I’d never been out on a Wednesday night before (three classes on Thursday will do that to you), and I was feeling antsy, so I was a terrible influence on my roommate and convinced her to come out with me and a couple of my guy friends I persuaded at dinner to go to Wan Chai (the Wednesday night ‘hot’ district in Hong Kong). We left around 10:30, exited the MTR station by the wrong exit (my excellent sense of direction struck again), ended up walking all the way down to the Causeway Bay area, before finally calling someone who directed us back in the proper direction to the bars in Wan Chai. So first, Katrin and I went up to this bar called Skits, which was an absolute bore – no good music, nothing too exciting going on, then we all headed down the street to Typhoon, and again, not very exciting. There was just about 200-300 people milling about and spilling out of the bar onto the street, plus, not that many of our good friends were out, so we decided to call it a night, and took the last MTR home again. At least I could now say I’d been out on Wednesday night and I knew I wasn’t missing a thing. 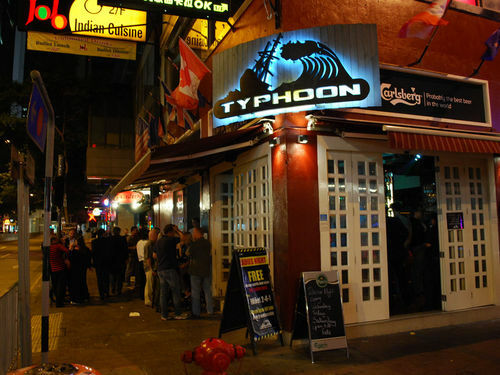 Typhoon bar. One of the many bars in Wan Chai. Thursday night was much more fun. Originally it was going to be a girl’s night in LKF, since most of the bars let girls in free or gave them free drinks on Thursdays, but then the guys joined in too. We didn’t even get off campus until 11 or so, but once I got there I split off from my original group and met another bunch of friends who had come from some other part of the island, plus I met some HKU students who had just finished classes for the semester and were celebrating. One of the people I met was a PhD student at HKUST who was from Iran, Mahdi (a friend of my first Iranian friend, Ali, whom I’d met the week before in LKF), and neither drank because they’re Muslim, which was perfect for me (since I’m not a big drinker either and enjoyed having sober people to talk to). We ended up hanging out most of the evening talking, walking, watching drunken people, and running into other HKUST and HKU people in the streets occasionally. I had a great time though – it was a different kind of Thursday night than the normal club scene. In the end, I met up with one more friend and the four of us took a night bus from Central to Hang Hau (much closer to school) and then a taxi from there back to the university – it was also quite a different experience than the usual cab ride home. Another first I could check off the list now. Don’t miss out on my next post when I finally dived into the glorious shopping and bartering Hong Kong is famous for. Oh yeah, and I also went hiking too. I love the juxtaposition of it all. 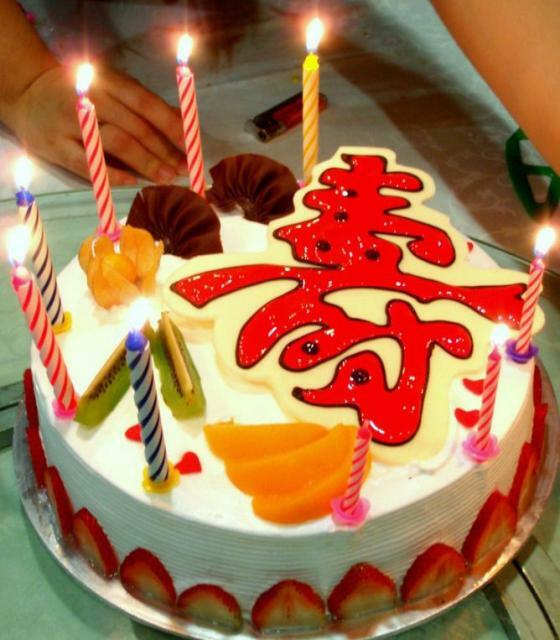 This entry was posted in Asia, Hong Kong and tagged Asia, Birthday, HKUST, Hong Kong, LKF, Travels, Wan Chai on April 18, 2014 by Paige N..